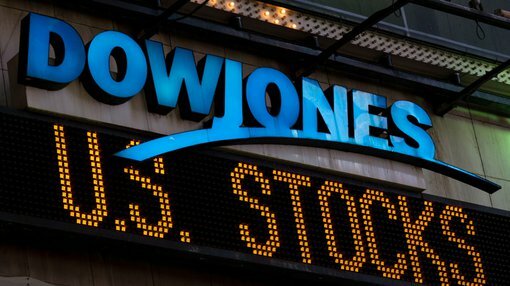 The Dow continued to track sideways on Wall Street overnight as a mix of negative geopolitical sentiment and uncertainty regarding the upcoming earnings season dominated trading activity. Perhaps of more significance was where the Dow was rather than where it finished. At one stage it was down nearly 150 points before closing at 20,651 points representing a decline of only seven points. Further gains in the oil price helped to provide index support, and there was also a marked increase in the gold price, factors that help to drag the index out of the mire. Regards the latter, the 1.8% surge in the gold price is arguably the best gauge of investor sentiment as money is traditionally directed into the safe haven precious metal during periods of uncertainty. 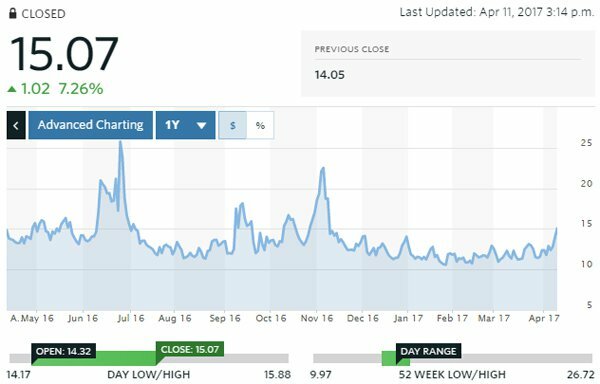 One of the best forward indicators of where the market is likely to be headed is the CBOE Volatility Index (VIX), often referred to as the ‘fear gauge’. As can be seen below, it hit a five month high overnight, a level it hasn’t seen since the presidential election. The NASDAQ also came under pressure last night, falling 0.2% to 5866 points. While negative sentiment rubbed off on mainland European markets, the FTSE 100 managed to eke out a 0.2% gain, closing at 7365 points. However, this was largely assisted by some big stock moves in the gold sector. Elsewhere, the DAX shed 0.5% to close at 12,139 points and the Paris CAC 40 came off marginally, as uncertainty regarding the upcoming French election tended to impact the broader region. On the commodities front, gold was a star performer increasing from the previous day’s close of US$1254 per ounce to finish just shy of its intraday high of US$1277 per ounce, once again, a level that hasn’t been revisited since uncertainty prevailed around the US election period. With the Australian dollar hovering just below US$0.75, the Australian dollar gold price is sitting at $1700, making local producers appear very attractive. Companies that could receive support today are Northern Star, St Barbara, Evolution Mining, Regis Resources Silver Lake Resources and Saracen Mineral Holdings. Of course, market heavyweight Newcrest Mining also has Australian based projects, along with its overseas operations. While Independence Group is a diversified gold play, its exposure to nickel which came off more than 3% overnight is likely to work against it. However, copper experienced a nominal gain, suggesting that Australian based copper-gold producer, Sandfire Resources could come into the mix. Elsewhere in the base metals space, zinc continued its downward slide, falling from US$1.18 per pound to US$1.16 per pound, a level it hasn’t traded at since early January. As it often does, lead followed suit, but its decline was only nominal compared with the circa 2% fall in zinc.